Let me start by stating a few things. The anime “Gantz” is one of my favorite anime of all times. I have not read the manga by Hiroya Oku. When I review an anime/manga adaptation, I try to focus, as little as possible, on how close to the original it remained; instead, I make an effort of watching it as a stand-alone work. The above considering, I think Shinsuke Sato’s two-part movie is one of the best films based on anime/manga. Two classmates, Kurono and Kato, are killed while trying to save a homeless person who had fallen on the subway rails. After their death, they find themselves in an apartment, where a man cabled inside a black sphere forces them to participate in a death game, along with a number of other people experiencing the same fate, where they have to kill particular targets if they want to survive. Among those, the most central are Joichiro, a mysterious young man who seems to have some knowledge of what is going on, Kei, a girl who just committed suicide and Yoshikazu, a middle aged man too afraid to follow the mission. As the story progresses and the revelations follow one another, more people are introduced to the story: Shigeta, who is investigating the series of murders of people who then disappear; Tae, a girl who hasa crush on Kurono, and Aikawa, an idol who seems to have a mysterious connection to the case. To get the comparison with the anime out of the way, I would say that Sato retained the surreal atmosphere of both the manga and the anime, although he almost completely excluded the sexual aspects and many of violent ones as well. Visually, the film stayed very close to the original, with the help of magnificent special effects and cinematography. Some fan service does exist, particularly in the way Sato focuses on the figures of Natsuna Watanabe, who plays Kei and Ayumi Ito, who plays Aikawa, with the extremely tight uniforms implemented by all the characters giving a nice excuse to do so. Furthermore, the film does not lack in gore, chiefly in the first part, with the action scenes being particularly violent. The second part, although somewhat more elaborate in this aspect, with the sword-fights being truly top-notch, seems to be a little more “tame” regarding the violence, as much as in all the PG-18 aspects. Visually, the cinematography combined with the impressive SFX make the film quite pleasant to the eye, in sci-fi fashion, while another combination, that of Tsuyoshi Imai’s editing with Kenji Kawai’s music induces the movie with a very suiting, quite fast pace, which occasionally resembles a violent music video. Add to all that a number of almost blasphemous comments regarding friendship, love, family, religion, good and evil, and the basic concept that looks even more weird in live action, and you have the backbone of the project. Once more, I would have to state that the second part seems to rush a bit regarding the narrative, as it tries to wrap up the many loose ends rather hastily, and I think that the concept would be much more complete and fulfilling if a third part was shot. This however, does not mean that the concept as a whole is not entertaining or accomplished. The acting follows the general rules of the scifi/action films, essentially providing a background to the action scenes. In that frame, Kazunari Ninomiya does a good job portraying the searching-for-a-purpose youth, with the same applying to Kenichi Matsuyama, who portrays a decisive but rather struggling with his true nature young man. Yuriko Yoshitaka as Kojima is quite convincing as the girl-in-distress/girl-in-love, Kanata Hongo is a great villain as Joichiro, while Takayuki Yamada as Shigeta could have more time to unfold his character. (although there is a TV-movie titled “Another Gantz”, which does just that ). The same applies to Go Ayano who plays a small but significant part, while Natsuna Watanabe and Ayumi Ito provide the eye-candy aspect mentioned before. 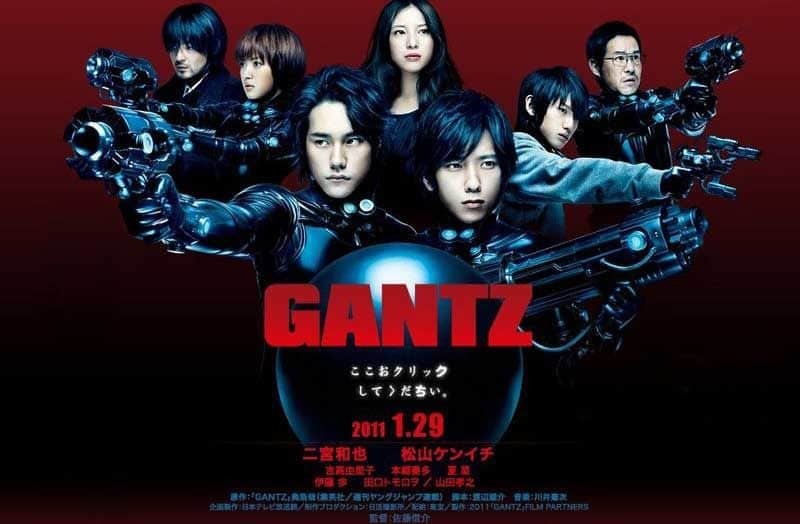 “Gantz” is a very entertaining project, which will satisfy all fans of sci-fi, action, and even those of exploitation a bit, despite the fact that fans of the anime/manga may not be completely satisfied. (Let’s face it though, they are rarely satisfied with any kind of live-action adaptation).